We still don't have any snow here in Stockholm, but I suspect it will get colder soon, and the water will start to freeze into ice. So with that in mind, here is today's Fabergé object - a seal on a piece of ice floe! It was created around the year 1900! 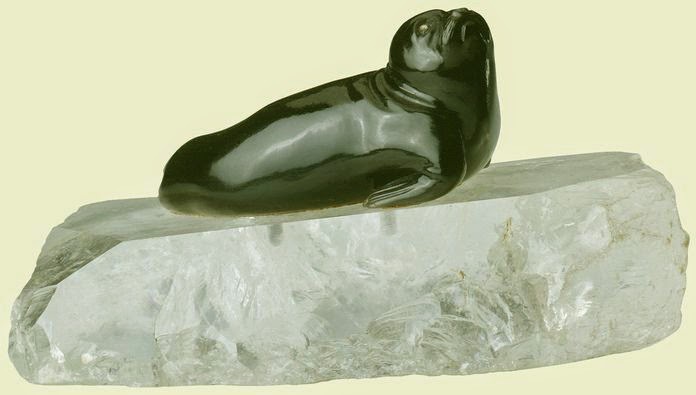 The little seal is carved from a piece of obsidian, which perfectly captures the wet sheen of the animal's body. The ice floe it is lying on is a piece of rock crystal. The dimensions of the piece are 2.5'' x 4.8'' x 3.1'' (6.4 x 12.3 x 7.8 cm), and it is part of the Royal Collection.